In 2015, climbers Tommy Caldwell and Kevin Jorgesen spent 19 harrowing days climbing the Dawn Wall, one of the hardest rock climbing routes in the world. The sheer 3,000-foot face on Yosemite’s El Capitan was considered impossible—32 pitches of blank granite, with more hard pitches than every other route on El Capitan combined, according Yosemite climbing legend John Long. Caldwell spent seven years wearing out his finger pads in a painstaking hunt and peck approach to find a way up the imposing face. Now the story of this odyssey is being told on the big screen in “The Dawn Wall,” a full-length feature documentary by Sender Films that airs one night only nationwide Sept. 19. Director Josh Lowell and Director of Photography Brett Lowell spent seven years hanging from ropes documenting Caldwell’s battle with the Dawn Wall, at times questioning if the story would ever reach a conclusion. Perseverance paid off, and together with Director Peter Mortimer, founder of Sender Films, they have produced an artful and gripping film that delves into the human spirit and what is possible in spite of—or perhaps because of—profound pain. Caldwell’s suffering on the wall serves as an antidote to the pain in his soul. The film chronicles the climber’s remarkable life, which includes his sudden rise to climbing fame as a teenager, surviving a kidnapping in Kyrgyzstan, losing one of his index fingers in a table-saw accident, and living through a heartbreaking divorce. “The Dawn Wall” is the story of a man possessed with an impossible quest. Suffice to say he sent it. 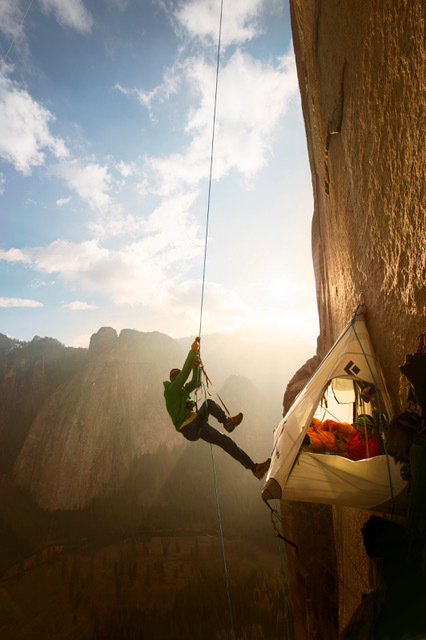 Even non-climbers will love this film. The film will be shown at select theaters throughout the U.S. For a list of theaters playing the film and to purchase tickets, visit: dawnwall-film.com.